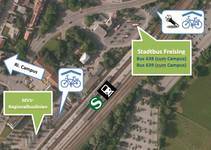 At Freising station there are two larger covered bike parking locations (see picture). One of them features a bike repair station where you can inflate bike tires or fix your bike. When leaving the station via the main entrance, you will find the city bus lines on the right-hand side. Lines 638 and 639 are running to Weihenstephan Campus. 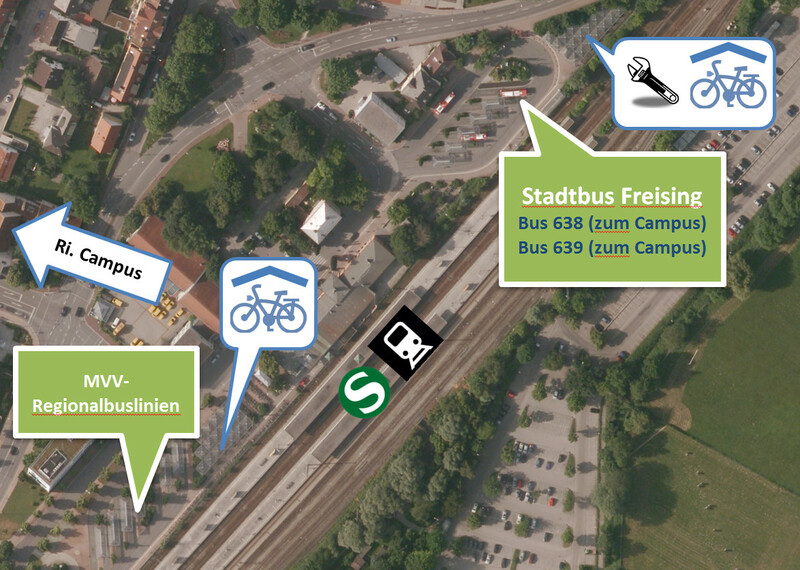 From Freising station you can reach the campus by city bus lines 638 and 639 (stop Weihenstephan) within approximately 7 minutes travel time. 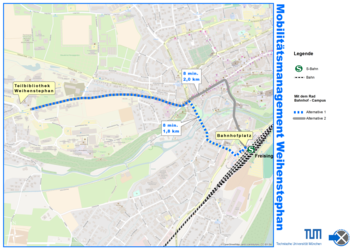 Line 638 direction Hittostraße/Fraunhofer-Institut (schedule) runs 4 times per hour taking 8 minutes from Freising station to Weihenstephan Campus. Line 639 (fileadmin/pdf/Anfahrt/BUS_639_ab14.12.2014.pdfschedule) runs every 30 minutes taking 6 minutes from Freising station to Weihenstephan Campus and via the forest science buildings and “Lange Point” back to the station. Weihenstephan Campus is also easily accessible from almost all other parts of the city by transferring from other bus lines at Freising station or in the old town. Here you can find the network map. On the Munich Transport and Tariff Association (MVV) website you can find more detailed schedule information. There is also a very helpful app for your smartphone called “MVV-Companion” available on Google Play as well as Apple App Store. You can easily reach the central area of Weihenstephan Campus from Freising station within approximately 8 minutes (1,8 km) (see picture below). The recommended route is almost flat. At the station there are covered bike parking options a bike repair station where you can inflate bike tires or fix your bike (see station map above). By foot it will take you approximately 20 minutes from Freising station to Weihenstephan Campus. Most ridesharing possibilities are currently available on the Facebook page "Mitfahrzentrale Freising". Trips to and from Freising can also be found on Blablacar. There is also TUM bulletin board which offers some ridesharing possibilities. With a smartphone and the “TUMitfahrer” app you can also find or offer sharde car trips between all TUM locations (Weihenstephan, Garching, Munich). You can download the app from Apple App Store or Google Play. Route Planer - You can plan your route from your starting point to Weihenstephan Campus. Please be aware that parking spaces at the campus are limited. TUM’s "green" Campus Weihenstephan is quite extensive - new students and visitors might find this a litte confusing at first sight. Therefore, it’s a good idea to consult the maps listed below before visiting a new destination on the campus.